I caught Journey on their first ever UK tour. Half the band had been former members of Santana, they had a fancy for melodic jazz rock, but had recently added a new singer. Live that night he only sang half the set, the others either instrumental or handled by their original keyboard player Gregg Rolie. It was a disjointed affair at best. It didn’t help that The Pat Travers Band guesting as support had blown the doors off the place. Such uneasy baby steps on these shores resulted in them falling down the pecking order over here as AOR struck gold and Boston, Foreigner and even Toto struck big over here with both the rock crowd and the mainstream. Certainly they focussed on the USA where they regrouped, bringing in Jonathan Caine as keyboard player who began writing songs to match vocalist Steve Perry’s syrup and soul vocal pipes and they scored a series of hit singles, primarily ballads, on the Billboard chart alongside some bankable albums. 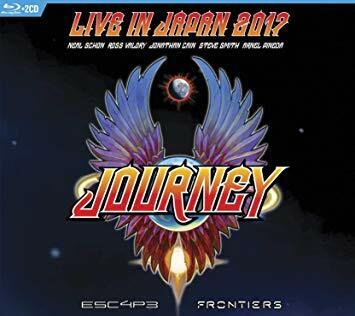 Chiefly Escape and Frontiers, the featured records on this DVD, Blu-ray and CD collections recorded over in Japan. It finds them in their element, not only playing their big hits but also tracks not played in a long time, plus some obscurities. For those of us largely on the outside looking in, it’s worth noting that the line-up here is only one man down from those who recorded those albums. Sure drummer Steve Smith has been in and out pf the band three times, but it’s inevitably singers that make or break a band. It’s clear from the beginning Arnel Pineda can sing well. His voice plays close in the ballpark to Steve Perry’s with a little bit of Mr Big’s Eric Martin in there too. But can he hold an audience’s attention? Well, let’s give him the once over, because first impressions may prejudice us but they count: Visually he’s on the short side with a youthfully cropped bonnet. When we first see him, he’s decked out in a leather jacket and baseball boots like he’s going for an audition for West Side Story. He removes the jacket and tries on a variety of t-shirts for size through the recorded shows. It’s only when he trades them in a for an all-in-one black 80s aerobics style jumpsuit that you turn your nose wrinkles with incredulity. But like I say, he can sing well; my better half agrees, joining me to watch. Woman can be such harsh critics though, and she thinks he looks out of place because he’s young, and the others aren’t. Jeez, they look in good shape for old dudes though. Bass player Ross Valory and drummer Steve Smith have the kind of snazzy taste in shirts you don’t get down at Primark. Guitarist Neal Schon looks like he’s been lifting weights, and possibly some work down on his face, but if you can afford it. A smile is free however, and Jonathan Caine could do with looking a lot less intense. So that’s what they look like. What about the set? Well, their scarab with wings logo is emblazoned as backdrop right across the Budokan’s lengthy stage, spotlights shining strategically down, out and all about. There are also some screens either side of the stage showing close-ups, but they were for the audiences, you only notice them on film near the end. Pineda jumps around, stands on monitors, gets down on his knees ala James Brown, and the others aren’t shy when they break out into a rocky instrumental section. Your attention is kept fixed pretty much throughout because this is exemplary camerawork, taking us 360 degrees round and the whole nine yards in and out, giving each band member quality screen time, we get precision clarity; all the dramatic moments are captured. So much so you have to appreciate it even if you don’t like the music. So onto the important thing… There’s a good chance most of those purchasing this will be earnest Journey fans already. For those of us still hesitant about the band they do have a tendency to follow a rocker with a ballad so there’s that sense of predictability to proceedings. But, if all you thought you’d get were ballads, you’re mistaken. It opens with Schon bathed in light stage front, foot on effects board, playing a familiar refrain as Pineda bounces on stage to utter his opening lines that the crowd really get excited. It’s the big hit, ‘Don’t Stop Believin’. “Oh, they’re doing that Glee number” my better half declares. “I think Glee featured it because The Sopranos series used it,” I mutter back, ignoring the megabucks Journey has been pulling on this since they first recorded it. Live there’s an extended guitar solo that helps the song rise to the occasion. Pineda saddles up beside Schon as they rock up for ‘Stone In Love’. It doesn’t truly engage until the tempo changes into a pomp rock sway wherein the guitarist’s notes soar away, and Pineda gets some audience participation going. Of the rock tunes you also get ‘Keep On Runnin’, the Meatloaf meets Deep Purple sounding ‘Dead Or Alive’, and the rather stately Mother, Father’ that has an air of early gothic Queen about it, and the driving rhythm rock with a fusion flavour that is ‘Chain Reaction’. None really has a standout riff that defines it, whereas so many of their ballads bear significant guitar motifs. The stage dark, Caine’s stately piano is joined by Schon’s echoing trills to herald ‘Who’s Crying Now’. Now here’s a well known tune treated with respect but also some added gravitas. Pineda phrase the song differently , a subdued world weariness to his voice – despite his relative youth – at it totally suits the song as sung today for time distance don’t dull life’s regrets. He stand on a monitor, the camera pans back dwarfing his size further, and like Dio the voice overcomes any stereotypical jokes; the audience sing along heartily. Guitar fetishists will happy to read there are excellent close ups on Schon as he takes in another excellent solo. Underneath the sound builds and is carried effortlessly by Smith’s percussive timbre, and frankly it’s this straight backed drummer who’s the man of the match throughout the set. You hear an offstage keyboard player when Caine takes up rhythm guitar. This is Travis Thiboddaux and he also appears on stage to sing three numbers himself. ‘Lay It Down’ is a kind of hazy throwback as if McCartney and Townsend had decided to write a power pop tune, ‘After The Fall’ is Smokey Robinson armed with a Les Paul, and the Latin flavoured bop of bop of ‘Frontiers’. Higher-pitched than Pineda, he sings well. ‘Separate Ways (Worlds Apart)’ is the only place in the set where Pineda himself doesn’t shine. He lacks the vocal power to cut above the music, the tempo of which also feels a little slower than on records. A shame because the filming is particularly awesome with blue lights bathing the arena no corner overlooked during a space-rocking prog intro, cutting to a close up on Smith crashing his gong, before shifting to Caine on synthesiser. Those with long service records each do an introduction. Schon with ‘Still They Ride’ – that at its heart is cowboy rock with a white picket fence, voice and guitar locking together in easy melody, later Caine will play piano while talking about writing ‘Faithfully’ and how Japan was where they first played it live. Ross Valory will introduce ‘Escape’ itself – You suspect there may be something of a quiet alpha male presence about him. He’s held his position in the band since day one, while never being profound on the instrument or bolshie in print, but stands tall a deep gravelled voice, one’s impression being he’s the mediator or fulcrum between possibly more temperamental egos down the years, but who knows. The song itself rocks and pomps with musical sub- themes buzzing around jazz rock parameters. The crowd goes will for ‘Open Arms’, Caine’s keyboards particularly effective here and while yet another ballad, ‘Send Her My Love’ sees each instrument defining its role by fitting, weaving in and out sweetly. Ready to rock, Schon grits his jaw as he power tumbles out the chords to ‘Edge Of The Blade’. Hard rock with an offbeat shuffle, tipping its hat to a jazz rock past and an R’n’b soul. There’s a rather good upshot on Schon as during his solos the wing on the back stage’s logo give the impression of him flying as the solo soars. Smith’s drum solo leads into ‘Back Talk’. I’ve never heard it before, and at its heart it’s a call and response number using a Bo Diddley beat as if given some aggro-guitar attack ala Jimmy Page. A song with attitude that came as a genuine surprise, and one from which on listening you can tell Van Halen took several pointers. ‘Rubicon’ is likewise unexpected, sounding like the main influence for 90125-era Yes. It proves to be the last number of the main event, cameras looking down on Smith as he rises to strike his gong one last time and red rose petal confetti raining down from the sky impressively. As they return to encore, Schon informs us they’re about to perform ‘La Raza del Sol’ that didn’t make it as an album cut. Heavily Santana styled but dark and heavy too, the sleeve notes reveal it’s actually a Perry/Caine co-write. Caine also opts for organ to solo here, rather than his favoured piano, a fine interchange between him and Shon as they rally forward, then as feedback tears through we hear the restrains of Hendrix’s ‘Third Rock From the Sun’ along with sundry Jeff Beck lifts, Smith then unexpectedly kicking it into a barroom shuffle groove and they’re into ‘Lovin’, Touchin’, Squeezin’, that’s pop rock down at the American diner or drugstore, with lots if hands waving out in the audience and not a phone camera in sight. And that’s it. No extras on the DVD. I’ve played the CDs on their own and most tracks keep my attention, some even have me singing along. The film footage I repeat once more features top notch work from the camera crew and directors. If you don’t like ballads you’re never going to like this lengthy collection, and for all their old jazz rock and Santana influences they could do with swinging looser more, but I was genuinely impressed, expecting to do a hatchet job (As guilty revenge for Rollie singing to my girlfriend of the time back in the day) for when they work the songs Journey perform on this live collection are an euphoric embracing sound. Value for money this.